MYTH BUSTER: Why Is the Black Unemployment Rate So High? We have all heard the chatter about the high unemployment rate among African Americans versus that of white Americans (currently the unemployment rate for white Americans was 5.4 percent and for black Americans it was 11.5). But until now, I never known anyone who has really dissected the numbers and the reasons for the huge disparity until now. Valerie Wilson, of the Economic Policy Institute, took a look at the numbers and what she reported was actually quite fascinating (well at least for me). Wilson basically writes in her report that the resiliency of African Americans is one of the main factors behind the disparity when it comes to unemployment. What this means is that unemployed African Americans have been less likely to give up the search for a job than other unemployed workers. The black–white unemployment rate ratio has increased during the recovery because the black unemployment rate—3.3 percentage points higher than in 2007—has fallen slower than the white unemployment rate (which is just 1.2 percentage points higher than in 2007). This is the case for two reasons. 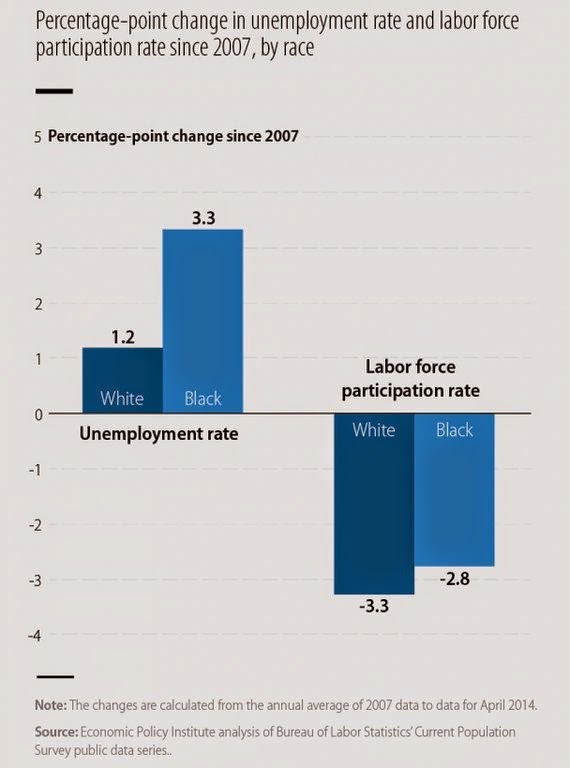 First, black employment has rebounded by less than it has for whites. Indeed, the share of employed, African American, working-age adults in the population is 4.6 percentage points below the 2007 average, while the comparable figure for whites is down 3.9 percentage points. The other reason the black unemployment rate has not recovered as much as the white rate is the aforementioned resilience factor. In other words, relative to whites, a higher share of jobless blacks have continued to seek work—which means they have remained in the labor force and therefore been counted as unemployed. This is reflected in the fact that the percentage of blacks in the labor force (employed or actively seeking work) has fallen by less than the comparable figure for whites (a 2.8 percentage-point decline versus a 3.3 percentage-point fall). Put simply, the resilience of African American labor force participation is actually contributing to the growing black–white unemployment rate gap. Many don't understand how the Bureau of Labor Statistics calculates the unemployment rate. The rate is only based on people who say they are continuously looking for jobs. This is one of the factors that explains why the rate for African Americans is twice as high. Put simply: Black folks don't give up so easily.